Customs clearance efficiency at the border ports in Northwest China's Xinjiang Uyghur Autonomous Region significantly improved last year thanks to reform measures. The average clearance time fell 67.5 percent to 29.41 hours, and the export clearance time declined 56 percent to 1.16 hours in December, from a year earlier, according to Urumqi Customs' data, local news portal ts.cn reported on Monday. Costs were also reduced. In order to cut costs and improve efficiency, Urumqi Customs formulated 21 reform measures including the integration and optimization of operating procedures and the streamlining of document processing in 2018, the report said. The "examination after clearance" policy was implemented for five categories of mineral imports. Nine vetting procedures were also cut. "Now the customs clearance is so fast. 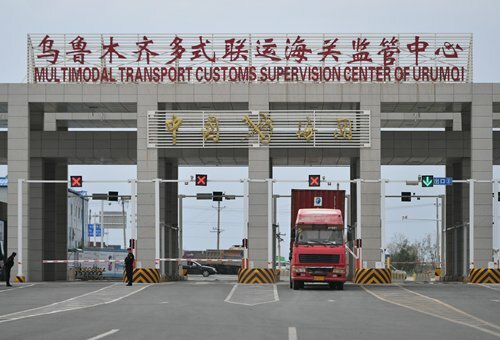 Trucks just need to stop in the yard for a short time, whereas previously it took a day and a half to go through the formalities for exporting goods," Zhu Xiaojuan, the manager of the customs clearance department of Sinotrans&CSC Xinjiang Co, was quoted as saying in the report. Xinjiang has been transformed into a logistics hub under the Belt and Road initiative. The freight train logistics center in Urumqi handled 603 trains to Europe as of August 2018, equivalent to 85 percent of the total for 2017, according to the Xinhua News Agency.